Obesity can harm nearly every system in a child’s body—heart and lungs, muscles and bones, kidneys and digestive tract, as well as the hormones that control blood sugar and puberty—and can also take a heavy social and emotional toll. (2) Children who are overweight or obese also have substantially higher odds of remaining overweight or obese into adulthood,(3) increasing their risk of disease and disability later in life. These 5 Habits can be applied for children in order to encourage healthy habits from a young age, at the right pace. You can introduce one positive habit each week for 5 weeks. In the first week, your child will make only one change. In the second week, you will continue with the first change, then add one more – and so on. Make only the one change every week, and keep the rest of your routine exactly the same. if you want to accelerate the process, you can implement one habit a day. Habit 1 – Light Meal: Your first change is to replace just one meal a day with a lighter one. Breakfast could be cereal with low-fat milk, whole-wheat sandwich with low fat cream cheese, eggs with some low-fat cheese or toast, or any meal < 250 calories. A fruit meal is a healthy and quick option for kids who usually skip breakfast. Try making a fruit salad so your child can try different types of fruit at once. Habit 2 – PV Meal: “PV” stands for protein and veggies – in addition to the Light meal, you’ll now replace the largest meal of the day with one that has only protein with vegetables. For most kids, this will be dinner – fish, chicken or meat with any vegetable side dish or large salad with a protein topping and low-fat dressing. Habit 3 – V-Plus Meal: Make the remaining meal each day a “V-Plus” Meal – the V is for veggies! Eat as you normally would (protein and healthy grains/starches), but for seconds, it’s veggies only. Some examples include tuna or chicken wrap/whole-wheat sandwich, whole-wheat pasta with lean protein or low fat dairy topping, grilled chicken with baked potato fries or basmati rice/couscous. Low calorie whole-wheat bread or pita is readily available in stores. Kids usually enjoy whole-wheat bread varieties more when they are toasted or warmed up. Habit 4 – Exercise: Studies show that exercise improves weight loss statistics and reduces body fat, not just weight. Exercise prevents disease and reduces stress levels. This week, simply add 10 minutes of cardio to your routine, just 3 times per week. Aerobic physical activity: Bicycle riding, brisk walking, dancing, games involving running and chasing, such as tag, martial arts, running and sports such as soccer, swimming, and tennis. Muscle-strengthening physical activities: Games such as tug-of-war, body-strengthening exercises like push ups and sit ups, and swinging on playground equipment/bars. The key is to get moving. Any exercise is better than no exercise. Physical activity from a young age will teach children healthy habits that can last a lifetime. As long as they are doing some exercise, they will build up to the exercise recommendations. It is important to encourage children to participate in physical activities that are appropriate for their age and ability, that are enjoyable, and that offer variety. Seltzer or flavored water (zero calories) is preferable. It is best not to drink commercial fruit juice because it lacks fiber. Don’t drink regular soda. Each soda really adds up. Your child could gain 3/4 lb a month from just drinking one regular soda every day. Over a year, that could mean an extra 9 lb’s. Low fat yogurt is nutritious, provides calcium, and has been shown to assist in weight loss and maintenance. We want to keep it below 120 calories because this usually insures that the yogurt is low fat and does not contain excess sugar. Finding creative ways to encourage fruits and vegetables in your child’s diet can be fun for the entire family. Taking the time to introduce a variety of fruits and vegetables to kids can help develop a lifetime of healthy habits. Keep a bowl of fresh fruits on the counter, presenting them in child-friendly ways. Refrigerate cut up fruits and vegetables in bite size shapes or putting them in small plastic bags or containers makes them appear more interesting. Set a good example. Snack on fruit and order low-fat salads, soups, or vegetable sides when at restaurants. Reward kids with a prize of his or her choice for eating more fruits and vegetables. Let children choose which fruits and vegetables to serve. Letting them pick a new vegetable for dinner, gives them a feeling of autonomy. Make fruits and vegetables fun. Try making a fruit salad and the child can try different types of fruit at once. 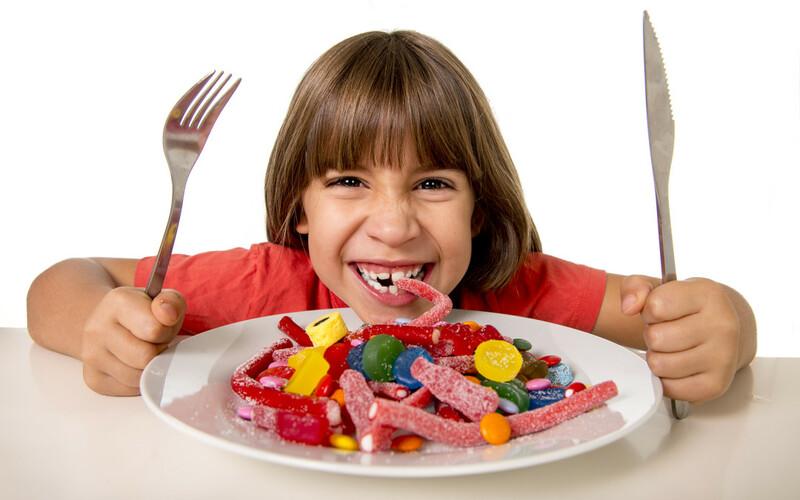 For some foods, it may take multiple times before a child acquires a taste for it. Encourage your children to just take a bite! They shouldn’t be afraid to try a new fruit or vegetable. Smart Exceptions: One of the most effective ways to deal with unhealthy cravings or non-nutritious foods is to avoid them – “Out of sight, out of mind.” Avoidance really begins at the supermarket. Before shopping for groceries, make a list and stick to it. Some households naturally resist change at first, so you need to be patient. You are not trying to convince them to completely give up their favorite treats. There is still place for “Smart Exceptions”, but haphazard exceptions can only lead to health and weight complications. Children want their favorite snack from time to time. Choose any snack that is less than 100-120 calories. Obviously, these are neither the most nutritious nor the best food choices, but within these guidelines of ‘Smart Exceptions’, they offer the possibility of having a responsible snack or treat. Today, 80–120 calorie snack foods have become very popular, and it is often clearly printed on the label. When it comes to ‘Smart Exceptions’, quantity is of utmost importance. The challenge is to control the amount eaten. Know your child because everyone is different. If you see ‘Smart Exceptions’ lead to further unhealthy snacking, you may want to experiment with different types of snacks or limit them, at least until their new habits take root. Stick to fruit or strips of vegetables after eating a ‘Smart Exception’ until the next meal, if the child is still hungry. It is a good idea to eat ‘treats’ outside of the house. If you are going to allow them at home, it is smart to buy single-serving pack sizes. It is much harder to limit it to one or two scoops of ice cream from a tub than it is to eat an ice pop or small cup of ices. Likewise, when one finishes one small package of baked potato chips, it is finished. Keeping track of your child’s progress with a chart (see below) will increase motivation and add some fun to the process. It should only take 2 minutes a night. You could offer a reward or prize at the end of the week for getting a certain score. You can adjust the incentive according to your particular child’s program and goals. Be fair and always offer positive reinforcement. Making changes to your habits is always a challenge. It takes time for the mind and body to get used to new healthy habits. It is an expected part of the behavior modification process. So have patience and view these changes as a foundation for making long-term realistic good habit changes. Most important, you should be a good role model. When your family observes your new good eating habits on the 5 Skinny Habits and how wonderful you look and feel, they will naturally want to emulate your success. World Health Organization. Global strategy on diet, physical activity, and health: childhood overweight and obesity. Singh AS, Mulder C, Twisk JW, van Mechelen W, Chinapaw MJ. Tracking of childhood overweight into adulthood: a systematic review of the literature. Obes Rev. 2008;9:474-88.